It’s easy to completely forget about Bobcats athletics while you’re on your summer vacation. While you might not have the motivation to read about a team while sitting on the beach, the Bobcats sports landscape didn’t stop. On June 27, Drake Bolon, former Assistant Athletic Director of Marketing and Sales, stepped down. He then pleaded guilty to the charge of tampering with records via a Bill of Information, which is when someone agrees to the charges before coming in front of a grand jury. Bolon has been placed in the Athens County Empowerment program for three years. The program rehabilitates low-level first-time offenders. He also agreed to pay the university $6,000 in restitution. The Post will stick with this story, as it is still developing. 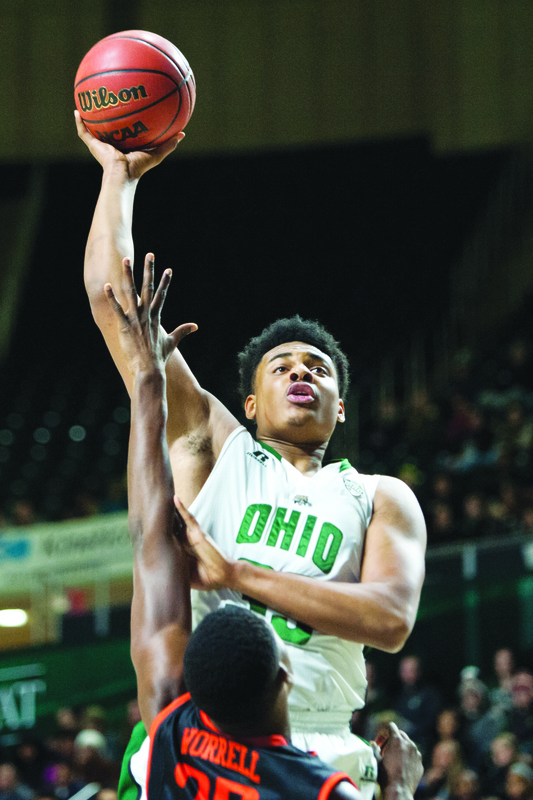 Ohio junior forward Antonio Campbell (#33) puts up a shot against pressure from Bowling Green redshirt freshman forward Rasheed Worrell (#32) during the first half of their game on January 12, 2016. In addition to losing star point guard Jaaron Simmons to Michigan, Ohio officially lost its former MAC Player of the Year. Antonio Campbell suffered a broken foot in early January and missed the rest of the regular season. Ohio lost in the MAC Tournament semifinals to Kent State. Campbell was averaging 16.4 points and 8.9 rebounds before his injury, and was consistently regarded as one of the MAC’s premier post players. With Simmons, and then Campbell, out of the fold, it wasn’t a model offseason for coach Saul Phillips and the Bobcats. Ohio made the NCAA Tournament for the second time in three years, but fell in the first two games with losses to Kentucky and Indiana. The Bobcats lost 6-4 to the Wildcats and 11-2 to the Hoosiers. Ohio finished the season 31-28 after an incredible run in the MAC Tournament, but couldn’t solve the power of Kentucky and Indiana. Ohio had a truly magical season last year. The Bobcats had the most dominant pitchers in the MAC and one of the most dominant in the country, as they rode that to the inaugural National Invitational Softball Championship. With a 42-18 record, the Bobcats finished with the most wins in program history. Though they didn’t win the NISC or the MAC, they had a year that won’t be soon forgotten. Former Ohio pitcher Tom Colletti signed with the San Diego Padres organization as an unrestricted free agent after three seasons as a Bobcat. Colletti made six starts last season with 27 appearances, a 3.66 ERA and led the team with a .196 opponent batting average. He reported to the AZL Padres 2, a Rookie League team in the Arizona League.